I love books so of course I love bookstores. Love. Them. As a kid, thought I'd grow up to own a bookstore because I couldn't imagine anything more wonderful than spending all day every day surrounded by books. Magic between covers, books. If not a bookstore, then maybe I'd end up working in a library. I completed every summer reading program the Lewiston, Idaho, library offered, set records, got special permission to get books from higher up in the bookmobile where books were shelved by grade and I had already read everything for my age group. Grew up, worked in the student bookstore during college (but mostly in the back office doing accounts payable reconciliations--good times, good times). After college, learned about the economics of publishing working for a small regional publisher that went bankrupt, learned how close to the margins a bookstore operates as we sold to them (nobody in this scenario was making much money, as it turned out). 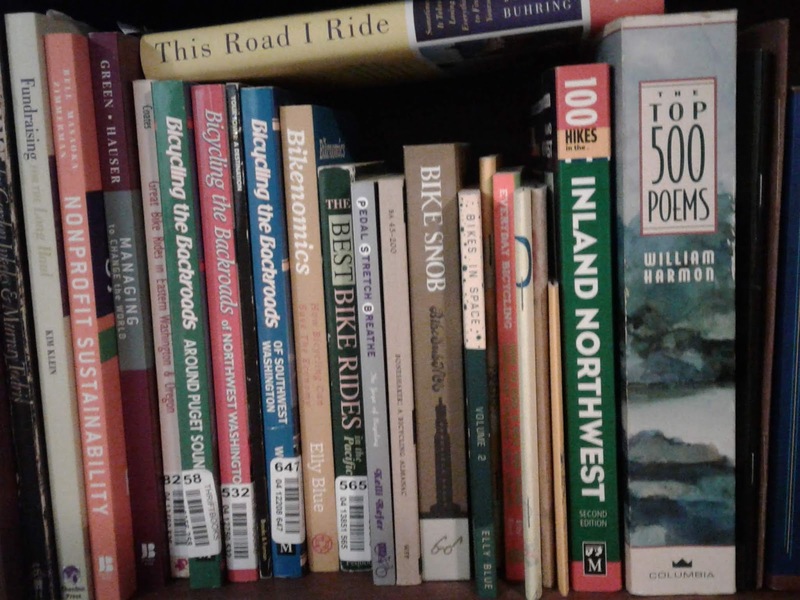 Didn't open a bookstore at that point, although years later I got to do a small retailing bit at the Washington Bikes office in Seattle's Pioneer Square and naturally included books in the mix. Pretty much everywhere I go on vacation or on a business trip I go into bookstores. I buy books even when we're traveling by bike and I have to haul the weight of the book for another 150 miles. So, yeah, I've been a voracious reader my entire life, although at times life has interfered with reading via the mechanism of little things like having children. I accumulated books by the boxfull as I moved from house to house, culminating in a giant 5,000-square-foot historic home with lots and lots of built-in bookshelves and room for more bookcases. In a way my books served as the equivalent of rings on a tree, showing the ages and stages of my life. There sat a longstanding love of the Arthurian legend going back to a summer vacation when I bought John Steinbeck's The Acts of King Arthur and His Noble Knights in a bookstore in Oregon. It anchored the fantasy and science fiction collection. In nonfiction my love of words and my linguistics and English degrees explained the collection of books on language history and how the brain processes words. My interest in science nestled there with the works of Stephen Jay Gould. My love of history showed up both in historical fiction and in works that took a topic and explored it through the ages in interesting ways. My master's in public administration and additional graduate work toward that unfinished PhD in political science added books on public policy, political culture, community engagement. I started bicycling for transportation (and joy and freedom and health and the environment and-and-and) so that started another big collection. We bought a smaller house that had neither miles of built-in shelves nor much room for bookshelves, given the layout of walls, windows and doors. I had come to a crossroads. And a certain portion of one bookshelf was dedicated to books on simplicity, downsizing your belongings, things like that. I took a deep breath and decided that I would set a lot of my books free to be read and loved by others. Like, a LOT a lot. I dramatically downsized my book collection to mostly nonfiction--books I might consult rather than stories to be reread, with a few exceptions. A bit of a shock to the system, but I survived the surgery. But then my reading life changed radically because Betsy made me take on her old Kindle. I really didn't think I wanted one. I like the physicality of books: being drawn by the cover, flipping it over to read the blurbs on the back, opening it to read the first few lines and see if the author grabbed me immediately. I liked knowing how much more of the story I have by the thickness of the pages left so I can second-guess whether the author really can tie off all those dangling plot threads by the end. Yet in no time at all I found myself touching the corner of a physical page because that's what you do to "turn" the page in a Kindle book. So what turned me? The smaller environmental footprint of books that arrive as electrons, not as something that involves chopping down trees and carrying their deadweight back and forth in the form of logs, paper, and finished books. The light weight of the Kindle regardless of the size of the book I'm reading. No more getting painfully whacked in the face if I nodded off reading an especially hefty tome, like Pillars of the Earth. The fact that I never, ever run out of something to read. There is always another book. The ability to read works by authors who might never land a big print publishing deal, but who can get visibility within the world of electronic publishing. I do miss the physicality of books, and I'd say I notice some differences in how I process digital content as compared with analog. For one thing, without the constant visual reminder of the book's cover I don't think I remember titles and authors quite the same way. The search function on the Kindle lets me find everyone eventually, though, so there's that. Some books really don't lend themselves to the medium. I buy those, I buy books to give as gifts, I buy more books than I ever did, I still have bookshelves full of books, I regularly recommend writers on Twitter (and get to tell them directly how much I love their work, which is awesome). Still voracious. Always reading.